D-Handle design for extra control. For overhead and down drilling applications. Electro-pneumatic impact system maximizes impact force yet minimizes vibration. Vario-lock positioning enables user to rotate and lock chisel into 36 different positions to optimize working angle. Three operational modes hammer only; rotation only; hammer and rotation. Variable speed control. Built in depth stop for drilling multiple holes of the same depth. STANDARD EQUIPMENT: 360 degree auxiliary handle (1 612 025 032), depth gauge (1 613 001 010) and case (2 610 967 857). SPECIFICATIONS: 6.9 amp motor, 120V AC. No-load 0-1,100 RPM; 0-6,150 BPM. Maximum drilling capacity: 7/8'' concrete, 1/2'' steel, 1'' wood. Thin core 2-1/2" bit. 1/2'' - 5/8''optimal concrete capacity range. 17-1/2'' length. Double insulated. U.L. Listed. I am not a contractor, but I always seem to have some type of project going on that requires a large variety of tools. In the past whenever I needed to drill thru concrete I would use a heavy duty drill and have to sharpen the bits quite often. Then I got a 18 Volt Dewalt Drill w/ hammer function and this worked great, however if the hole was very big or there were several holes to drill, this would require extra batteries and the need to sharpen the bits often, but it always got the job done. Then one day a neighbor let me borrow his Bosch SDS Rotary Hammer and I drilled 10 holes in same time it used to take me to drill one. The next day I purchased my own and have used it several times. What a Great Tool to add to my collection. Bought this at the local Big Orange Retail Giant, cuz I needed it tonight. It chews up 35 yr old stucco very nicely, and much faster than a bricklayers hammer. Putting in new windows and eventually going to cut a weep screed opening across a 75 ft expanse so I wanted a tool that was fast enough and yet not too heavy for use on a ladder. I bought this tool to remove tile in my shower. For a couple hours, it worked fantastic on the hammer function. But then it just stopped hammering. The chisel would vibrate mildly, but not enough to do any good. After moving it around at different angles and letting it run, it would occasionally start hammering again, but not for long, and it's back in the mild vibration mode. It's totally useless for the hammer function now (which was what I bought it for), and I've gotten only about two hours worth of use out of it. I'll return it tomorrow, and I'll probably upgrade to the next model up in hopes that it lasts a bit longer. I have been using this hammer drill for over 6 years and it has never let me down. Has the attachment to use as a chisel, this works great for small jobs. 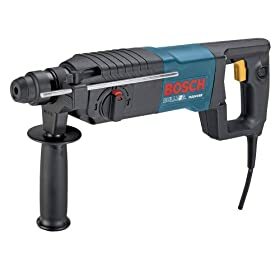 Bosch 11224VSR 7/8" SDS Rotary Hammer This drill made drilling 22, 3/4"X21/2" holes in a concrete slab like I was drilling in wood. The vibration was nothing compared to my Milwaukee. This one is a keeper. Whoa! 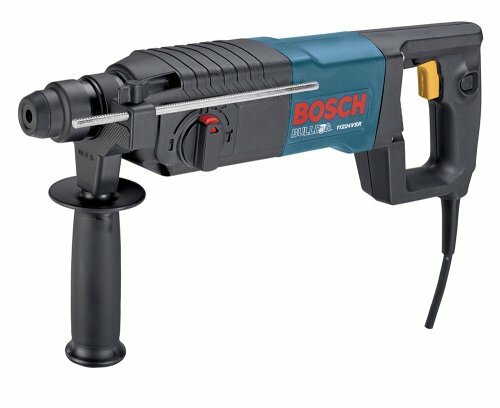 I'm normally a Bosch tool fan - gots lots of 'em. This brand new one, however, decided to give me three 3/8" x 4" pilot holes in cured concrete, then two 5/8" holes, smoked the motor, and quit on me. All the appropriate precautions (water-cooled bit, moderate pressure, etc.) could not keep this Humpty-Dumpty together. Really disappointing. I pinged Bosch to see what they are willing to do about it since it's over one year old and out of warranty. Will it be the end of my love affair with Bosch tools??? I've been very impressed with this tool is performed flawlessly in all respects. It is nice to use a quality piece of machinery that dependably performs day after day. I've mostly use this tool for drilling into block with a 3/16" bitand it absolutely choose straight into the block like I was drilling into foam. the case is nice and the ergonomics of the tool also were very helpful. I'm an electrical contractor and I use this tool primarily to break stucco when changing electrical panels. It's a great light duty tool. I had the DeWalt prior but it broke and they couldn't get parts to repair it, so I went with the Bosch. It's a much better tool.